How do I find my district/races? To find your district and election races, please visit the Action Center and fill out the appropriate information. Check your local newspaper—Most newspapers publish the polling locations prior to every election. Call the person that handles the Election Duties in your county to find the polling locations. If you have your voter registration certificate, it will list your precinct number. When you call, tell the person that answers the phone your precinct number to find out where your polling place is located. During Early Voting, you are allowed to vote at any polling location within the county. On Election Day, you are required to vote in your local precinct. You must register 30 days prior to the election date to be eligible to vote. The process is simple and all it takes is 3-Easy Steps! Request a Voter Registration Card. Mail to your Registar of Voters County Courthouse. Or you can visit the Liberty Institute's Register to Vote section, and you will be directed through the process! 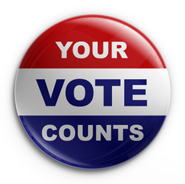 How can I be sure that I am registered to vote or if I am on the voter rolls in the county where I reside? To inquire about the status of your voter registration, call the Voter Registrar's office in the county in which you reside.